Brandeis could well have been describing today’s financial institutions (including banks) whose total control of credit limits enables them to charge usurious rates on unpaid balances and charge usurious penalties on debit card overdrafts and credit card late payments. 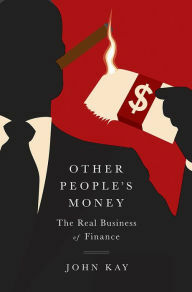 He provides additional comments about each on Pages 259-260, noting that the complexity of modern finance “has been designed, and has operated, principally to benefit financial intermediaries rather than the users of financial services.” Kay is a world-class pragmatist, driven by insatiable curiosity to increase his understanding of what works, what doesn’t, and why…and then share what he has learned with as many people as possible. Indeed, if you check out the profits of the ten largest banks — as I did recently — you’ll learn that more than 50% of their revenue is generated by fees. Worse yet, in recent years, the same banks have reduced the available funds on credit cards they issue so that they can charge higher interest rates on unpaid balances. Of course, cardholders’ credit scores are then lowered, enabling the banks to charge even higher interest rates. Be sure to check out the Epilogue, “The Emperor’s Guard’s New Clothes.” With only a few hundred words, John Kay captures the essence of what enlightened democratic officials and an educated general public can prevent.